Those of you who have been reading for a long time will know that I often share a new healthy recipe and a new-to-me find on Wednesdays. This week I’ve used that new-to-me thing in a dish that is definitely worthy of the Recipe of the Week spotlight, so consider it a very tasty 2-in-1 kind of deal. Let’s have a chat about dinners. Specifically, dinners you could eat every night of the week. When I was a kid, I would have eaten Kraft Dinner smothered in ketchup every single night if my parents had given me the choice. The thought of it now makes me cringe because the prime constituents of this dinner of champions include cheese and gluten (in the form of pasta), both of which I have sensitivities to. Luckily a love for vegetables emerged in my late teens and my staple I-could-eat-this-every-night-forever dinners have changed. As a reader of this blog, you might assume that I eat something new and pretty every night of the week. I wish it were true, but the creature of habit inside of me tends to opt for an entree-sized salad or some sort of stir fry about 99% of the time. As far as I’m concerned, stir fries are the jam because they’re the ultimate no-excuses dinner. No fresh veggies in the fridge? Use the frozen kind. Don’t like chopping vegetables? Use the frozen kind. Favourite vegetables aren’t in season? Use the frozen kind, or better yet, try a new-to-you kind that is in season. Think you don’t have a wide enough variety of veggies? Use whatever you’ve got. I’ve been known to make magic with just 2 heads of purple and green cabbage! Don’t have any protein sources in the fridge/freezer? Use canned tuna, beans or lentils, or serve your vegetables on quinoa – it’s a complete source of protein too! Don’t have much time to cook? 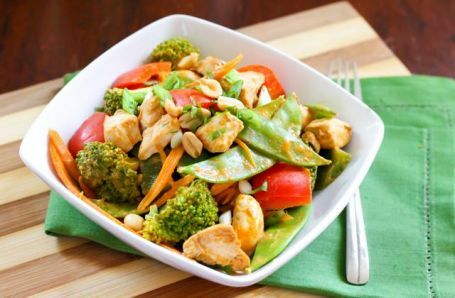 Stir frying is for you – it only takes a few minutes over high heat. My favourite item on that list of sauce ingredients at the moment? Peanut butter. I’m obsessed. While there are lots of bloggers out there who love PB in their sweet treats, oatmeal, smoothies, toast etc, I’m personally more of a fan when it’s used in savoury dishes. And because November just happens to be National Peanut Butter Lovers Month, I’m using that as my excuse to enjoy more. 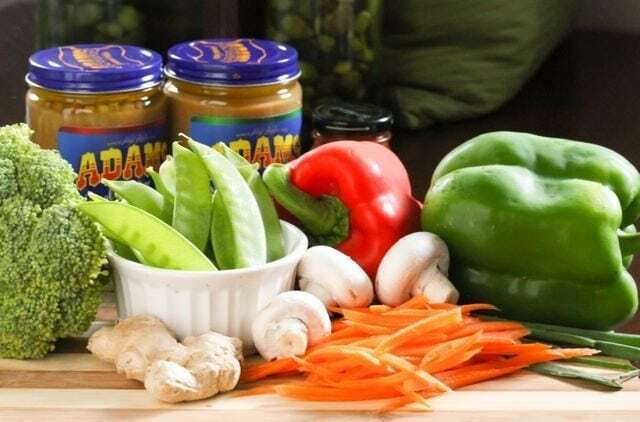 As I’m sure you’ve seen, there’s about a bazillion and six peanut butters available at grocery stores and health food shops these days, some of which cost a small fortune for a very small jar which could be demolished in an even smaller amount of time. Regardless of how I’m using it, there can’t be anything funky in the jar like hydrogenated oils, sugar, corn syrup, soy protein isolate or anything else like that in the jar. Short labels are where it’s at and I like my PB to contain just peanuts! 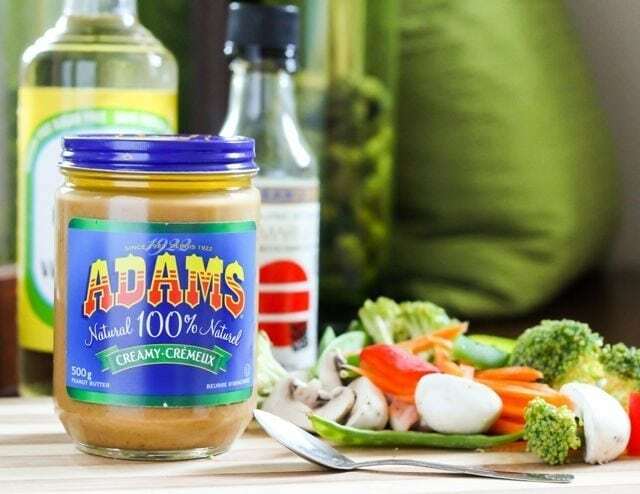 I recently learned about Adams 100% Natural Peanut Butter, a brand that is newly available in Ontario. Their Crunchy and Creamy varieties are now on shelves in our grocery stores (with unsalted options on the West coast), and each jar is made with only peanuts and a dash of salt – no preservatives, hydrogenated fats, stabilizers, sugar, or anything else. Because of this, there’s a layer of oil at the top that needs to be stirred in, but if you flip it over and store it upside down, the problem is solved! 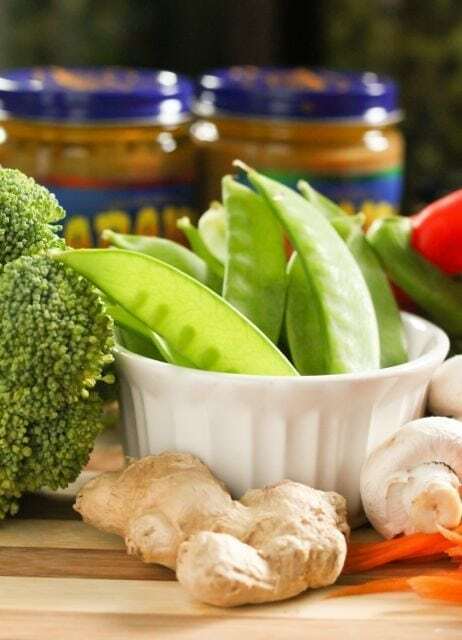 It’s taken me a few tries to perfect my recipe for Thai peanut sauce, and although it’s not the same as the conventional kind, it’s one of my favourite stir fry mix-ins to date. 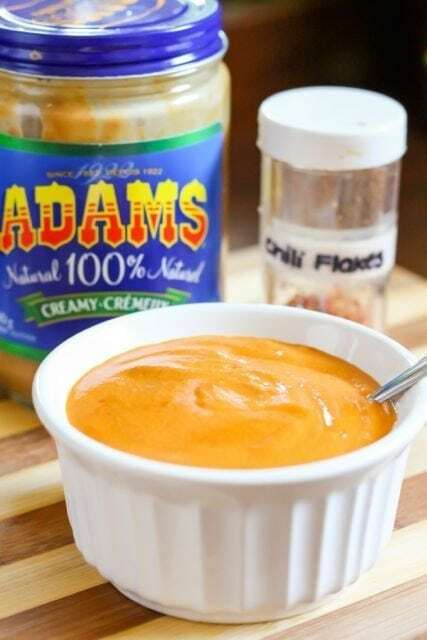 For those of you that don’t like chopping, don’t you worry – you can toss all the ingredients for the sauce into a blender, whirl away, and it’s done just like that. I’ve made big batches to store it in the fridge for as long as one week in the past, but it rarely lasts that long! Of course, you could use any vegetables you have on hand here. I used fresh, but if time is scarce or you feel like you need to eat ASAP, save yourself some time, defrost some frozen ones, and toss them around in a wok for a few minutes in this dreamy, velvety, totally addictive sauce. Whirl all the ingredients for the sauce in a blender or food processor. Pour them into a bowl and set aside. Melt the coconut oil in a large frying pan or wok. 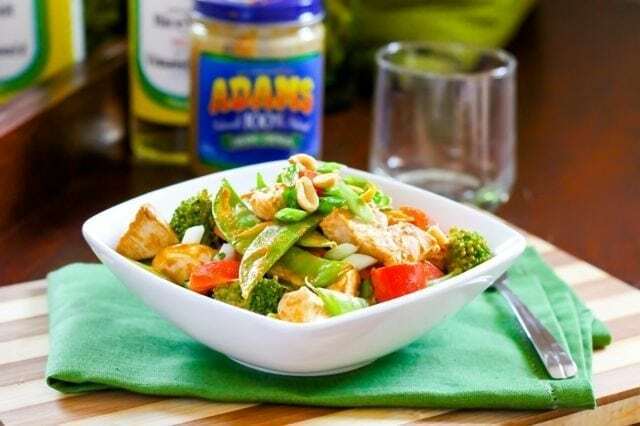 Add the chopped chicken breast pieces and stir fry for 2-3 minutes or until slightly golden on the outsides. Add the carrots, bell peppers and broccoli to the wok along with 3 tbsp water. Stir fry until they start to become tender and the broccoli turns bright green, about 3 minutes. Add the mushrooms, snap peas, and pour the peanut sauce on top. 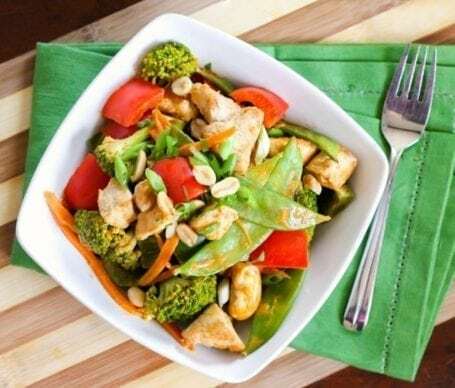 Continue stir frying for 3 more minutes, coating all the chicken and vegetables in sauce. Divide the mixture between 2 bowls. Top with green onion slices, chopped peanuts and cilantro, then serve. 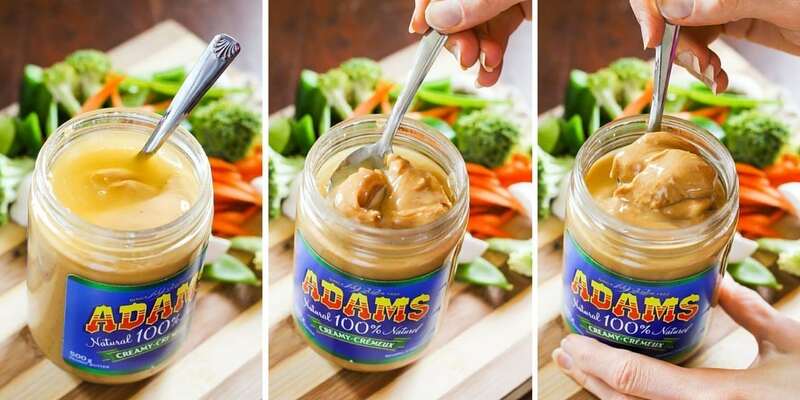 Sweet, savoury, or straight off the spoon: How do you prefer to get your PB fix? What dinner could you eat every night without getting bored of it? New Balance Giveaway Update: My New Balance Chameleon Jacket giveaway has closed, and the winner was Shirley. Thank you so much to all who entered, and I’ll be compiling all of your workout songs into a great big playlist for Friday’s post! Disclosure: This post was sponsored by Adams Peanut Butter but all thoughts and opinions are my own. Haha I’m responding to this as I eat salmon for dinner… for the 2nd time this week. 😉 I think you’ll LOVE the miso! As a peanut butter addict I LOVE dinners/actual meals that include peanut butter. I was planning on making some sort of stir fry soon so I’ll have to remember this! 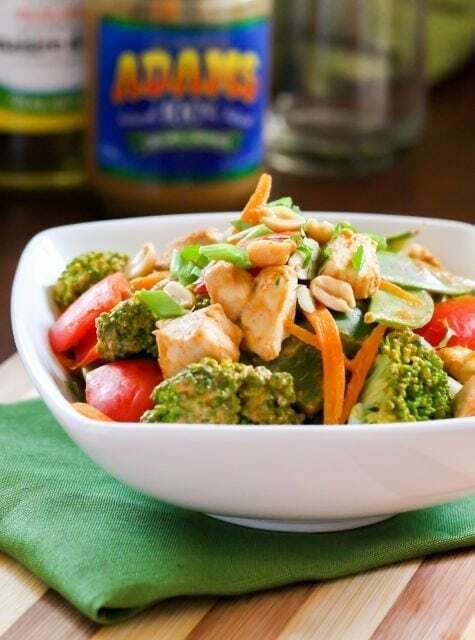 I love the specific examples you give for the “no-excuse dinners” especially regarding the vegetables — often times I hear “I have no time to cook vegetables” but frozen takes just a few minutes! Stir fries are the best when you need to get rid of produce! PB any and every way 😉 Just say it and I’m game! I have a love affair with peanut butter too! 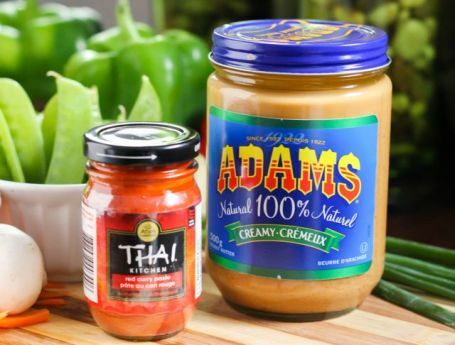 I’ll take it sweet, savory, or on a spoon 😉 I can guarantee I’ll love this sauce, red curry paste is on the grocery list. What a difficult question! Ha! I guess I prefer PB in sweet combinations but I guess it is because I am more used to it eating it sweet. So thank you for this recipe and reminding me how good it pairs up with savory foods! No probs, Elsie! I agree, there are so many awesome sweet combinations. I’ve been working on an African-inspired sweet potato peanut soup that I’m planning to post soon, so that’ll be another savoury one to add to your list! I’m eating a pb&j sandwich on my lunch break right now as I’m reading this! 😉 It’s my go-to lunch 3-4 days a week. I also like pb in sauces in savory dishes. It’s hard to go wrong w/ pb. I used to eat a big salad for din almost every night, but I finally got sick of them (this was after 2-3 yrs!). I still have 1 every now & then. Oh my gosh, PB&J brings back so many memories! I actually was more of a PB and honey fan as a kid (weird, right?) but I’d never turn down the PB&J combo. As for the big salads for dinner, I’m on one of those kicks right now (as in, if I’m not having a stir fry, that’s the plan B.) It seems that topping a bunch of greens with lots of roasted veggies makes them so much more satisfying in the winter! I have all of these in my cupboard so I am totally making this next week!! Oh man… that looks SO GOOD!